Even the demanding man towing his embarrassed wife and kids from one airline representative to another cannot change the system. I don’t know it yet, but my arbitrary placement in line is the first lesson in what will be the theme of my trip to Nepal. Life is random and senseless. The departure gate for our flight to Doha is at the end of long hallway making our group of passengers look more distinct than the usual muddling of people in airports. Most are transferring through Qatar to final destinations in India, China, and the Middle East. The waiting area is crowded, with only a handful of Westerners and many multi-generational families. There is less child-centered parenting and more collective patience for crying babies and whining toddlers. The older children are noticeably self-sufficient and well-behaved. It’s against this ordinariness that six manicured flight attendants, dressed in elegant magenta and gold uniforms evoking 1960’s aviation glamor, appear out of the blurry distance. They are so beautiful that I cannot turn away and take note that I have never once in my life ever looked so perfect. Two of the women move behind the gate desk and announce a mandatory recheck of all passengers. The process quickly reveals itself to be an unexpected lottery. For no apparent reason, the attendant on the left permits only one carry-on bag while the attendant on the right allows for two. The decision is baseless but consistent. A sense of community builds through the language of furtive glances, subtle head shaking, and the shrugging of shoulders. The lucky passengers look down as they return to their seats; some cannot hide their reflexive grin of good fortune. My friend Sarah and I calculate our position in line like chess masters thinking ten moves ahead. In the end, I keep both of my bags and Sarah is forced to surrender her backpack. While boarding, I pass the previously irate man, now calmly fiddling with his headphones, and deliberately look down the row to smile at his wife and kids. As we take off, the cabin glows with a hypnotic pinky-purple, similar to the color that emits from lights made for reptile tanks. I sit next to a couple making their way to Thailand for their honeymoon. They are both twenty-seven years old. In the time between their birth and sitting down next to me, I have been married to the same man and raised a family of four. Their sweetness stirs in me a longing to start over. We quickly fall into one of those buzzy, temporary, confessional bonds that can only happen on planes. After hours of talking and laughing, I close my eyes to rest and remember that life is random and senseless and we each create the meaning. Note: I traveled to Nepal in November of 2018. This is the first essay in a series that describes my experience. On the rare occasions when I travel alone, I’m reminded of how much I love airports. I don’t mind the endless sitting and waiting. It’s not in my nature, but I actually welcome the chance to be still. I’m most content with a full schedule, and usually found in motion or on a mission. I have never been good at resting, sleeping, or relaxing. Travel is my secret limbo where I allow myself to slow down. A place where I do not hold myself accountable to the tyrannical voice in my head that tells me to keep going. My maternal grandparents lived just a few hours away by the ocean, and my dad’s parents had a summer place on Lake George. It made it so that every family vacation was a drive, not a flight, away. I never went on an airplane, nor even visited an airport, until I was fourteen years old. It’s hard to imagine these days, but I grew up in an era where most people travelled when they were old. If you were fortunate and planned well, travel was the highlight of the last stage of life that began after the gold watch and a retirement party. My first flight took me to St. Simons, Georgia, to visit both sets of grandparents who were wintering in the same complex. I was in eighth grade, the last year of my bleak middle school run. I was that odd kid, the one that hovered on the outside ring and was picked-on more often than not. I was underwhelmed that the ticket was just a piece of paper. I had envisioned a golden ticket like the one that let Charlie into the Chocolate Factory. My disappointment was soon replaced; as the fasten seat belt sign dinged off and the smokers lit up, I remember thinking that flying was what a fresh start felt like. It was then that I knew I could choose to go anywhere and begin again. Big things happen on the edges of airports – lovers reunite, grandparents meet grandbabies, business people put on the hustle, and vacationers and students come and go. But once past the ticketed-passengers-only gate we become equals, souls suspended, hovering just above real life, in travel limbo. We are not attached to anything more than what we can put in a suitcase, and for a brief respite, we’ll soon be a mile above the world’s problems. It’s the spontaneous conversations that occur while waiting to board that I like best. If you are sitting next to me and you want to talk, I will gladly be witness to your story. I’m the person who really does wants to see the picture of your cat, the kids, or your garage remodel. When I’m traveling alone, I have the time and I’m truly interested. Every once in a while I’m surprised with a confessional conversation that can only happen when you travel solo. The ones that occur on long evening flights. Except for the sporadic halos of light beaming down on the crowns of a few readers’ heads, the cabin is dark and most of the passengers are asleep. It’s then when you discover that you’re serendipitously seated next to a person who could be a best friend if they lived in your city. You and your new limbo friend have to cram a lifetime of conversation in before you land. What’s said in travel limbo, stays in travel limbo. Of course most of the time when I travel, I quietly read and don’t bother anyone. Even then, just the notion of sitting alone among a plane full of strangers, being served terrible coffee and tomato juice, while flying through the air in a metal tube is thrill enough. It never gets old for me. 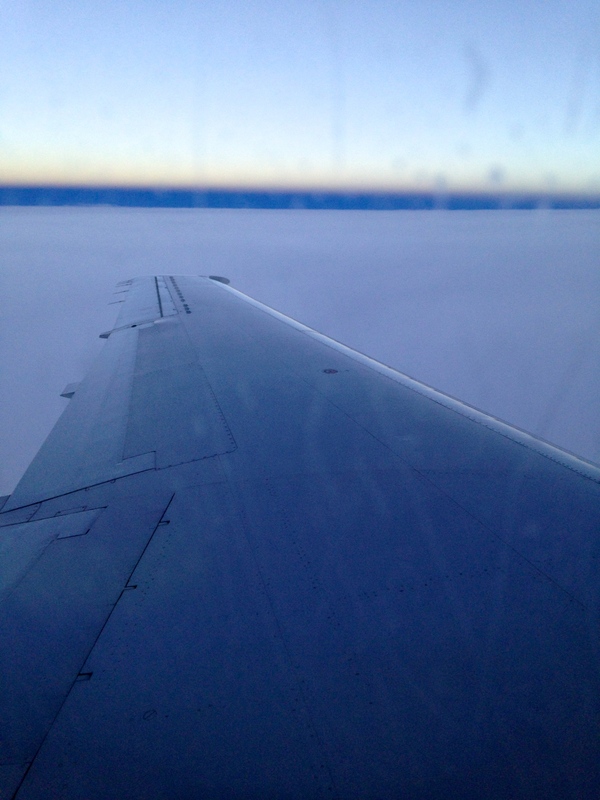 On my most recent flight alone, our plane was the last to land that evening. We were the only people walking through the terminal gate area, transitioning through the final hushed moments of travel limbo. I turned to take the elevator down to the curbside and was jolted by the light and all people waiting to be picked up, like baggage on the carousel. In an instant, I was no longer in limbo. Almost four decades separate me from my middle school misery, but I’ve never lost my initial reverence for the curative nature of a plane flight. Today travel is less escapist and more of a dive into the present, an exercise that holds the limitless potential of new people and places, the kind that gave me hope on that first flight to Georgia. I took the photo on my most recent flight from Grand Rapids, Michigan to Austin, Texas.